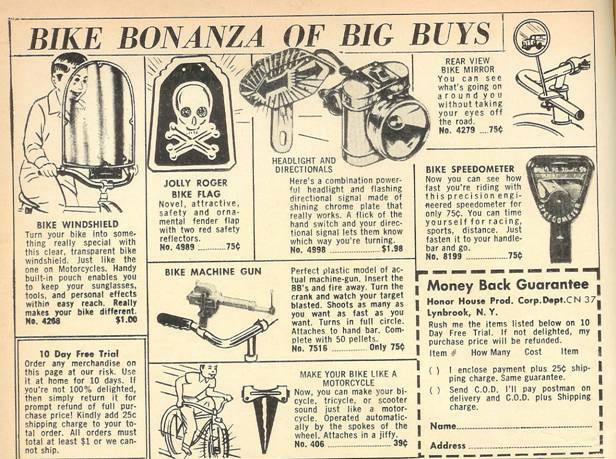 From Action Comics #346 (I think, I’ll have to double check on that), comes some of the most useless crap you could ever attach to a bicycle! Not to worry though, because there’s a 10 day free trial to try out that sturdy bike windshield! A bike windshield? Are you kidding me? And check out the tag line – “Really makes your bike different.” Yeah, it’ll make it real easy for the other kids to figure out who to beat the crap out of each day! I guess that’s why they also sell a Bike Machine Gun!! A Bike Machine Gun? Are they high? That’s all you need is a kid with a pellet gun flying down the street, mowing people down! I guess it would be good practice for future drive-bys. Try to stick one of those on your bike nowadays kids, and see how long it is before you no longer have a bike. I wonder who’d win in a joust, the kid with the windshield, or the kid with the machine gun? Oh man, there’s a clacker that “makes your bike like a motorcycle”. Couldn’t you save the 39 cents plus 25 cents postage and just use baseball cards instead? What did they cost back then? A nickel for 5 cards? But then again, I guess any kid who thinks a Jolly Roger Flag is attractive and safety oriented would be dumb enough to buy anything.